Is Your Cat Really the Best Mousetrap? If you’re a cat owner, you have probably seen your cat torture a spider or centipede in their day. 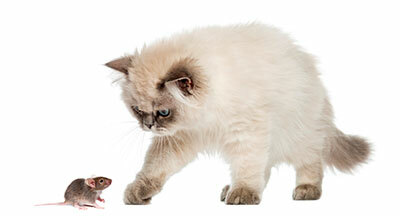 Perhaps your cat has even been so loyal as to prey on other pests in your house like mice. Even if your cat appears to be helping keep your household pest free, it is important to know that much of their achievements are for show, and even though you have a cat, it doesn’t mean you don’t have any pests! In fact, your cat could be encouraging more pests into your home, especially if they spend time outdoors. Cats can become great homes for fleas, ticks and bed bugs. Soft, warm fur of dogs and cats provide the perfect environment for these pests. They will feed on your pet’s blood and can cause health problems ranging from allergic reactions to serious tick-borne illnesses. Your pet is especially at risk during the warmer months of the year. If your cat brings any of these pests into your house, they can very quickly move to other pets or people, and in the worst case scenario all of your furniture and linens. Bed bugs can be the hardest pest to remove fully from your home if you have an infestation. Bed bugs do not necessarily live on your cat, but cats can bring them into your house. Bed bugs will feed on both humans and animals to survive. Once bed bugs have hitchhiked into your home, there’s no easy way to get rid of them. Effective elimination of bed bugs usually include monitoring and a combination of chemical and non-chemical treatments. Cats are fairly effective mouse deterrent, but if you have a real mouse infestation a cat will likely be of little use to you. Mice will build a home where they feel safe, in an unoccupied area to live and breed. However if they smell a cat, they will likely search to find a better place where they will not be hunted on a daily basis. Allow your cat access to the entire house, so that their scent has the best chance of being everywhere a mouse may want to make a home. If you are in an area with limited food and shelter, mice are more likely to enter the home. Also, not all cats are natural hunters. Female cats are generally better at hunting, and if you know your cat has work to be done, you are better off getting a cat that has spent some time outdoors, and not a kitten that will end up spending its whole life inside. If your cat is an outdoor cat, they may find mice outside, catch them and bring them home to show the family how talented they are. It is possible that a cat can even bring home a live mouse – so be careful that your cat is removing pests and not inviting them into your home! This entry was posted in Blog on 2015/01/05 by Any Pest.